I put a teaspoon or two of Hawthorn Berry Heart Syrup by Christophers Original Formulas into my morning coffee or other drink. I'm trying to bring my blood pressure into control. 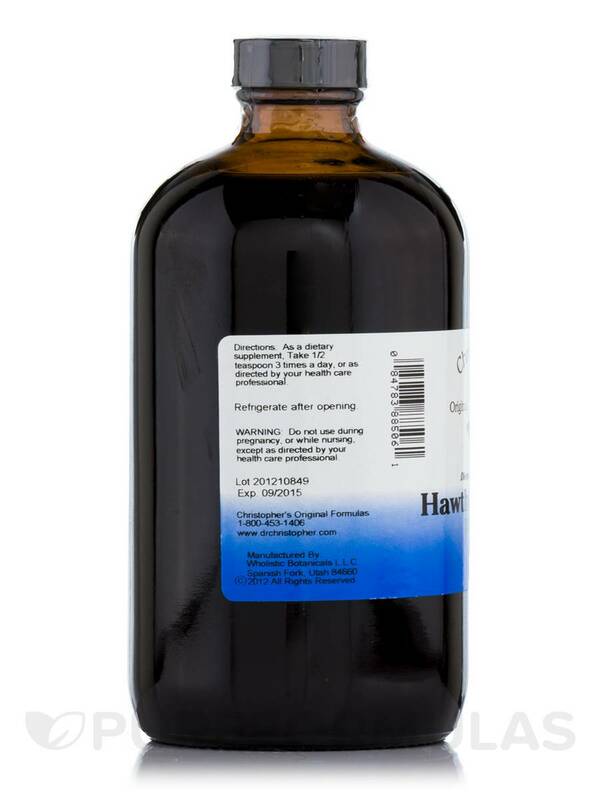 Hawthorn Berry Heart Syrup - 16 fl. oz (472 ml) from Christopher’s Original Formulas® works to help your circulatory system‚ specifically the heart. Researchers are of the opinion that during contractions Hawthorn may help in improving the amount of blood pumped. Many are of the opinion that the extracts from the Hawthorn berries may widen the blood vessels and may also have a role to play in transmitting nerve signals. According to some early researchers Hawthorn extracts may contain a compound called proanthocyanidin that may cause the relaxing of blood vessels that are farther from the heart. According to researchers‚ regularly taking Hawthorn supplements such as this one from Christopher’s Original Formulas® may reduce the triglycerides as well as low density lipoprotein levels that may be harmful for your heart. Europeans have always believed that taking Hawthorn extracts at the first signs of heart conditions may considerably lower the risk. Boost your heart health when you take Hawthorn Berry Heart Syrup - 16 fl. oz (472 ml) from Christopher’s Original Formulas®. Other Ingredients: Pure Vegetable Glycerin. As a dietary supplement. Take 1/2 teaspoon 3 times a day or as directed by your Health Care Professional. Refrigerate after opening. Do not us during pregnancy‚ or while nursing except as directed by your Health Care Professional. Pleasant taste on its own and easy to mix with other liquids if you want. Easy to take. 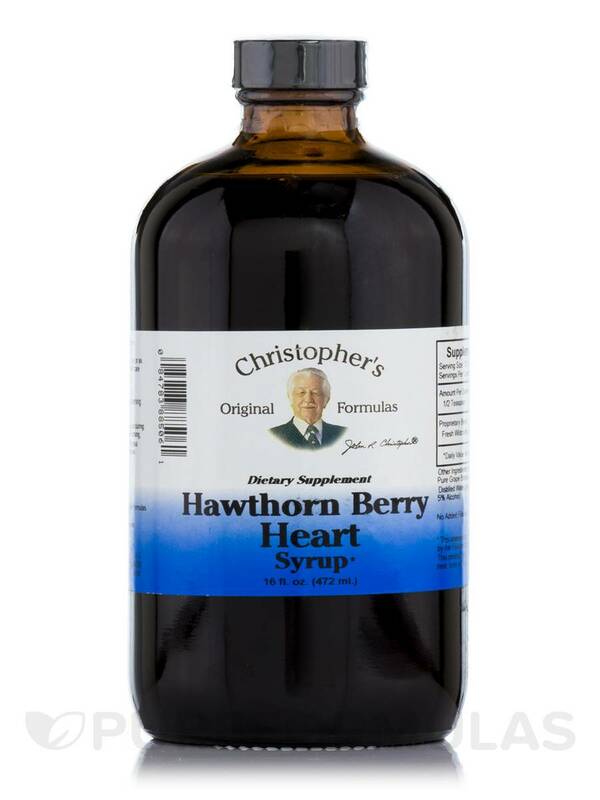 After my open-heart surgery and no improvement I started taking Hawthorn Berry Heart Syrup by Christophers Original Formulas along with other prescribed medications and other Herbal supplements and my life has greatly improved. My heart is strong and I feel much better. It makes my heart feel young and strong again. I use Hawthorn Berry Heart Syrup by Christophers Original Formulas to insure a healthy heart. Product is a natural remedy for healthy heart. It tastes great. The sixteen oz.. bottle last a very long time. Comes in nice dark glass bottle that lowers damage to product from U V light damage.